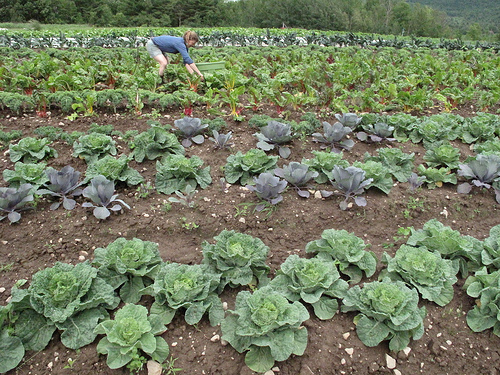 FREEPORT — There are no herbicides or pesticides used to grow vegetables at Chestnut Cliff Farm. It’s a strategy that’s worked well for the family farm for 60 years. 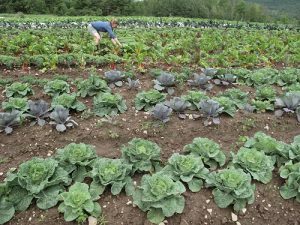 Every summer, family members cultivate about five acres and sell their produce at farmers markets and to local restaurants and grocery stores and directly from the farm. “We grow a variety of vegetables and have grass-fed beef,” said longtime Chestnut Cliff matriarch Pat Leininger. “Right now we have cabbage and we’re taking a lot of carrots, onions, garlic, beans, peas and beets to the markets. We will be having a nice selection of tomatoes, but it’s still a little early for them. Leininger said vegetable farming without the use of chemicals is labor intensive but has its rewards. Chestnut Cliff Farm works in conjunction with the World Wide Opportunities on Organic Farms organization by feeding and housing interns interested in learning the hands-on process of growing and marketing organic vegetables. It has utilized the services of more than 35 WWOOF volunteers for about five years. WWOOF volunteer students are of all ages and hold a common interest in alternative lifestyles and production of sustainable healthy foods. Read the full story via Organic farming thrives at Chestnut Cliff Farm in Freeport – News – Journal Standard – Freeport, IL.